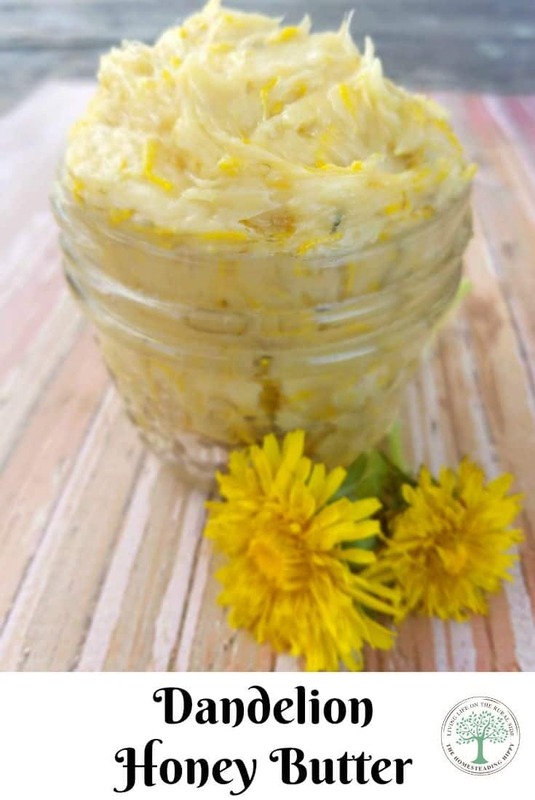 This spring, take advantage of the beautiful yellow blossoms and make dandelion honey butter. Spread on homemade bread, over bagels, muffins, and cornbread! Ah, Spring. The magical season that appears after a long, cold winter. The air is fresh, birds are singing, and the flowers are in full bloom. It’s a time of growth and renewal. On the homestead, it means babies, watching the bees emerge from the hive, and new plants growing. Spring is truly here when the flowers are all in bloom. I can’t think of any flower or plant that I DON’T love to see in the Spring, to be honest. I do have my favorites, though. One of the flowers I love the most is the dandelion. Truly, they are one of the most easily recognized flowers in the Spring. From their yellow blossoms to their deeply notched green leaves, the dandelion is a magnificent flower. In the Spring, the bright yellow blanket of sunshiney happiness covers my lawn. The flowers are a wonderful food for bees, who are winter weary. 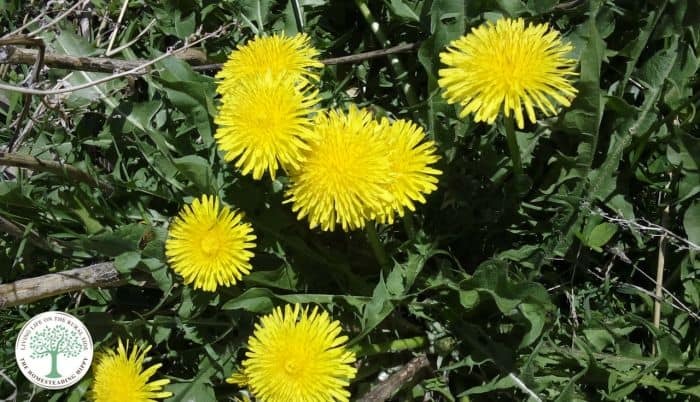 Dandelions can be made into wine, cookies, cakes and even pasta. There are lots of other uses for dandelion flowers and greens. From infused oil, and soap, to coffee substitute, the uses are almost endless! Foraging for dandelions is fairly easy. Most of the time, you just open your door, take a couple of steps outside and there they are! If you don’t have a lawn, try looking for some at a park, on a hiking trail, or asking a friend for theirs. Yes, you want to be careful about them being potentially sprayed with chemicals-ask first! That would make eating dandelions dangerous if they had chemicals on them. My neighbors agreed to not spray them anymore, as long as I come to get them, root and all. I am always more than happy to oblige! I’ll come to get you, little dandelion, and take you for my own! I collect as many as I can, leaving 5-6 flowers for each one I take. That way the bees have their share, too. Simply pop the yellow heads off the stem, gently shake to remove any insects, and add to your collection bowl. Snip a couple greens with your scissors, and save those for a delicious salad or pesto! Eating dandelions from yard foraging is truly a springtime treat. Supplies you need to have with you while foraging! The yellow dandelion blossoms have a delicate, sweet flavor that is almost like honey. They can be used in a wide variety of culinary uses. They add just a light touch of sweet that is balanced by the other ingredients in the dish. Just make sure you pull only the yellow parts off, and not the green. The green stems can add a bitterness to your dish. This dandelion honey butter is just the right amount of sweet, delicate, and yummy. Spread some on homemade bread, over bagels, muffins, and even cornbread! It’s great even for tossing over pasta, or popcorn. It’s 3 simple, quality ingredients that make a delicious spread. Butter, honey, dandelion blossoms. You can just taste it right now, can’t you? What is your favorite way to use dandelions? 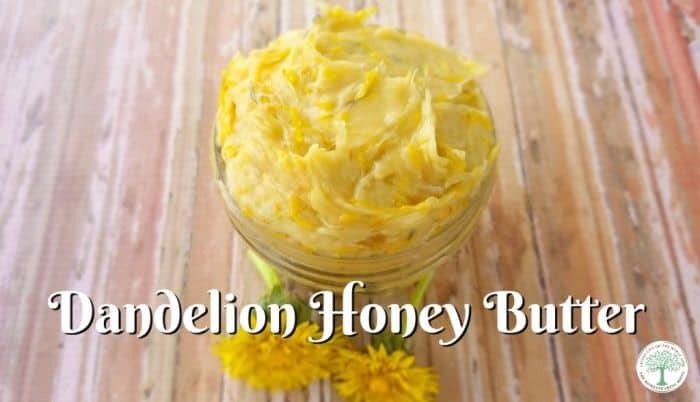 Will you try this honey butter? Be sure to pin this for later! Allow butter to come to room temperature to soften. Combine butter and honey, and whip vigorously with a fork. Store in a covered jar, in the fridge for up to 3 months. I can’t wait to try this!!! Thank you for sharing this! I, too, enjoy just sitting and watching my chickens and bunnies! Do you cut off all the green at the bottom of the petals or do you leave it on? Thank you – great recipe!! I pull the yellow blossoms off, not cut. That way I get as little of the green as absolutely possible. I haven’t! That sounds like a delicious addition! Please let me know how it worked for you!!! You can use honey with coconut oil. I just whip mine vigorously so that it is incorporated throughout the coconut oil. I think I’ll have to pass on this one…. I love dandelions thanks for sharing. My hole lawn is cover with them lots of bees this year. Just made my first batch. It’s delicious!! Thank you for sharing this simple, yummy recipe. I’m glad to hear you like it! Just made this. Yum! Thanks so much for an easy but good recipe. I am so glad you liked it! Could you use dried dandelions? I use fresh in this recipe, but if you wanted to try dried, go for it! The yellow part may just be more difficult to pull out. I bet this would be delicious at holiday meals like Thanksgiving and Christmas. Imagine it on fruitcake? These ingredients would preserve by freezing. oh, yummy!!! That sounds delicious!!! Sounds wonderful, will have to make it this spring. Looking forward to hearing how you like it! So the petals just do what? It seems like it isn’t a smooth type of butter but stringy. I’m confused on this part.